A business transcription service is usually a business which converts speech into a written or electric text document. Transcription services tend to be provided for business, legal or professional medical purposes. 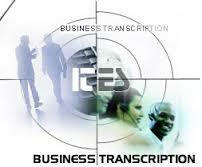 Business Transcription services are expected in almost every area of the business spectrum. The necessity to put into textual content, the spoken phrase, automatically creates requirement for business transcription companies that specialize in such a work. Mostly, it’s the businesses themselves that do their transcription work to avoid the extra cost of transcription providers.